The opposition UPND have once again been denied permits to hold their rallies in Lusaka’s Chawama and Kanyama Compounds. 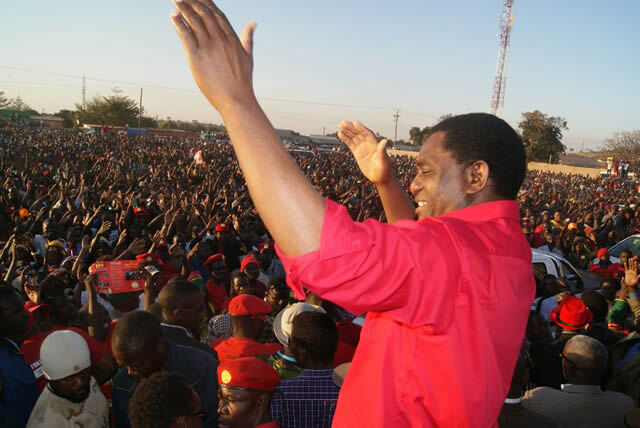 Mr Hichilema says the police have come under pressure from PF officials whom he said want to deny his Party an opportunity to deliver their campaign message to the people in the two compounds. “Once again UPND scheduled rallies in Chawama and Kanyama constituencies in Lusaka for this afternoon and Sunday have been cancelled at the last minute after the Police have come under pressure from PF officials, who are in a clear state of panic as elections draw closer. “We deeply regret that we will not be able to address the people in Chawama today, or in Kanyama this weekend. During the campaign period political parties have the right to deliver their message and manifesto to the people, and our people have the right to hear those messages. If President Edgar Lungu does not want to campaign or has little to say that is not for UPND to worry about,” he said. He wondered why the PF are denying them opportunities to deliver their message to the electorates when they claim to have delivered on their promises. “If the PF feel they have achieved so much during their time in office then why do they feel that they need to resort to such underhand tactics? The PF has seen how the tide is turning in Lusaka Province and their response has been to stop us campaigning at all costs. “As we have resisted their attempts to intimidate, threaten and even mutilate our supporters they have increasingly resorted to co-opting public institutions, whether it’s ZRA or the Police to deliver partisan objectives. This is unacceptable and the ECZ must quickly condemn such abuse of office,” he said. That’s PF for you, led by the humblest man south of the Equator!! But ba fikalla ba PF, let you burn in hell and when you lose let your kama satanic party distegrate with a month and be burried forever for all the attrocities you have been committing>. HH should not let these imbiciles get away with this, if it means meeting the police head on let it be, enough is enough……we the UPND supporters are ready to die for mother Zambia to save it away from dictorshp and mediocle leadership!! Dear Editor, Point of cirrection. The Police have simply asked UPND to mourn Hon. Request Muntanga (MHSRIP) in dignity instead of politicking this weekend. Muntanga was senior founding member of UPND thought sadly trashed by HH for a GBV Chief. He has died of a heart attack triggered by shock and depression seeing what has become of his party. Go well compatriot in patriotism, democracy and wisdom. Your UPND has become a concoction of kayakaya. I mean point of correction. Let’s stop scandalizing hardworking selfless police officers. They have simply requested UPND to mourn brother Muntanga in dignity by dedicating a weekend to his legacy. This is the tenth time upnd has been denied rally in lusaka since lungu came to power.without rigging lungu cant win.too sad lungu has colonial mentality.zambia the real africa.lungu is a good depiction of a lion in sheep skin.ati humble president!!!!! #lets meet the police head on. Seniour citizen shut up you are not the spokes person for UPND.HH also don’t be so docile toaccept what ever nonsense the police say.We the Galant sodiers of economic liberalization are ready to take PF thugs enough its enough.We went to Chawama we wanted to see any Pf cadre coming near our grounds today we were geared to kill.Enough is enough lets just fight now. I’m sure this is not the reason the police gave. This hyena is cooking facts for political expediency as if he bought his qualifications. Security is only compromised when UPND is trying to hold rallies and not when its PF. The police have shown blatant partiality and I am certain well meaning Zambians are seeing this and will pay back using the vote. Good luck PF! What security?why are there no security concerns when it PF Holding rallies? We have actually witnessed the Unrest that was at Down Town Mall Along the Kafue road this afternoon. The people have been Tear Gassed badly and the whole area looked like a war zone as UPND cadres were forced to scamper in all directions removing the attire in fear of being manhandled by Police. This fracas even affected the COMESA trading center and the surroundings. I wondered what the intentions for the police was either to stop the rally or to frustrate the UPND Supporters. Too bad for my ‘Hair Business’ Masai friends who Scampered in all Directions without knowing what was going on as the Police fired without checking where the cadres were gathered. there YOU HAVE IT FOLKS. but we will not relent until bad governance and backwardness is eradicated from the face of Zambia. .. We ask our President HH to continue with the message of hope. we will surely fight this little struggle and win because no one can stop us now. Zambia our mother land… abash useless slogans !!! Yes these are acts of a deceptively humble and so called born again Christian president named Lungu. BUT THOSE ARE HOT SPOTS. ESPECIALLY AT THIS TIME OF THE YEAR. THERE IS THE DANGER OF VIOLENCE BREAKING OUT. HOWEVER, THE POLICE MUST REALIZE THAT THE ISSUE OF CAMPAIGNING IS A VERY SENSITIVE MATTER AND THEY NEED TO GIVE CREDIBLE REASONS FOR DENYING UPND THE RIGHT TO HOLD THEIR RALLIES IN THOSE PLACES. THE POLICE HAVE CLAIMED THAT THEY HAVE ENOUGH HUMAN RESOURCE TO POLICE THE ELECTIONS. SO WHAT REASONS DO THEY HAVE NOW? I CANNOT VOTE FOR THE UPND, BUT THEY STILL NEED TO BE GIVEN THEIR RIGHT TO HOLD RALLIES WHEREVER THEY WANT. THIS IS QUITE FRUSTRATING FOR THEM. ESPECIALLY THAT PF IS ALLOWED TO HOLD RALLIES IN THOSE SAME PLACES. PLEASE ALLOW UPND TO LOSE FAIRLY IN A CLEAN GAME. NOT THIS. You see how the Zimbabweans are rioting ? The same will happen in zambia in 20 years time because lungu will never give up power by a fair ballot. He is the making of a mugabe or mu7. Because lungu thinks he spent our 10 billion US on roads he is entitled to be president by violence or not. How do you go and hold rallies when one of your very own Hon. Request Muntanga is no more? Where is our respect for the African cultural value of respect for the dead? Or does UPND want to go and celebrate the death of one of its gallant sons who contributed greatly to what UPND is today? If only you knew the condition of Hon. Muntanga you would probably not have been talking of rallies. I only hope UPND was able to visit the man during the time he was hospitalized. Hon muntanga would have wished for nothing more than the continuation of his work. His work will not be in vain, the struggle continues. Fool! !!! Muntanga is our member and we are handling that and does that concern you as a PF cadre? This report is quite incomplete, police can deny one a permit on a particular date but not forever. They must have reasons for doing so. May be they know the magnitude of security challenges they have to deal with and wish to mobilise better to avoid a break down in law and order or they have received intelligence information of some people who may wish to disrupt these very rallies and wish to deal with that threat before granting a permit. I am sure UPND demanded reasons from the ZP for their action and PF or Lungu was not one of them. It is a fact that UPND will one day address rallies in all these places and if people are with the party they will vote for it whether there is intimidation or not! HH and UPND please do not involve Police and ZRA in your cheap politics because you will need them if and whenever you win the elections. We need to put our resources and time to improve security in the country, we have very few security men and women in uniform and this should be the concern of every peace loving citizen. Public rallies have higher risks to both the cadres and party officials, allow the security wings to do their job . Shame on Chagwa. He is a cantankerous fellow pontificating christianity and democracy. *****s like Pio, Jane and others should understand that it is Chagwa( meno meno) who is the chief excutive of all govt institutions, ZRA, Police and others. who wants to vote for a tonga president? wapya baisa tuleumisha nafuti nafuti. efyo ambition wapwile ba hh. no more upnd after 11th, believe u me. Your Plans have failed because by this injustice you are simply campaigning for him. ECL has no energy to campaign he was frail so he is envy to see people who are healthy trotting around the nation. HH should Leave Lusaka and go to other places. Afterall Lsk is not Zambia. LPM managed to win in rural areas even when Lusaka was voting for PF. Bloggers bloggers bloggers!!! Do we ever analyse issues before commenting? We need to ask ourselves one question. Why have the rallies been canceled? Lets wait for the reason from the Police and not from politicians. Remember, the police has the duty to protect the lives of all the citizens, but politicians are sometimes selfish. Its public order act is always condemned by politicians when they are in oppositions, but actually embrace it as soon as they assume power. The President can be held accountable if anything was to happen to the people whilst holding the rally, remember there is intelligence. Not every time Lungu this Lungu that. Prevention is better than cure.better win or lose in the ballot box than people killing each other.you want to blame the police in everything,don’t compare the ruling party with the opposition.PF HAS THUGS ALSO UPND HAS THUGS,but those for pf feel they belong to the ruling party.so lets not deliberately allow these thugs to kill each other,lets use wisdom to protect these thugs.don’t politicise everything at the expense of life. Flimsy reason by partizan Police, UPND applied for a permit 2 weeks ago, why didn’t the so called police thwart and prevent any possible problems. Police need to improve their operational efficiency. Don’t deliberately leave the door open at night just because you have got a pistol or else,thieves may use that same pistol to end your life.when these thugs start killing each other,even the life of a policeman/woman is set at risk,so who should they care more?.you complaining or their lives.? More dununa come August 11 we are retiring hh your president from politics he should go back to nega nega to play with animals. What kind of reporting is this…why also not attempt to get a comment from that Police spokesman. How can you say go and campaign in neganega when his Exc. ECL says its one zambia one nation. Lets face the facts here what happened can be partially be shouldered on the law enforcement officers one they were not on the ground to read the situation. secondly if they had intelligence on their finger tips they should have notified the marshalls earlier than just today at a short notice, who could have at the right time informed their member of the development. The act of cancelling the procession in the last minute really raises emotions of concerned people, this resulted in expressed angry reaction of the people who wanted to attend the rally. Hope the law enforcement officers have learnt one or two things on today’s incidence where a life has been lost. We mourn the death of the young lady. MHSRIP. Zambian is not ready to have a tribalist for a president VIVA ECL VIVA PF! One Zambia One Nation, One Nation, One leader, Edger C Lungu mpaka 2021. Believe it or Not PF is wining. God blesses the humble and exhorts them. The Big headed devils in red and blood thirty who have grouped them selves within a short period of time out of jealousy will Fall. Edger is a CHAMPION no wonder the Late SATA liked him and entrusted him with all powerful positions in Government. Ask, Winter, GBM, Sampa and Scott they will attest to this. Edger outnumbered them, hence they became so JEALOUSY and left PF. There is no proper explanation to their departure from PF apart from POWER HUNGRY AND JEALOUSY. 4. If you don t stop those evil schemes of trying to make the country ungovernable you will not be able to campaign, simple and straight.